Why Indiana? Well, my cousin, Ryne, was about to marry the girl of his dreams. He and Audrey asked if Adali and Ada could be in their wedding so off to Indiana we went. It was going to be a fast and furious trip but we had several things we needed to get done when we were there. Upon arrival at McCormick's Creek State Park, we got to our super unlevel spot and finally got backed in, then I started looking around... “Where is the water hook up?” Whhaaaaat!!! How in the world did I miss that? 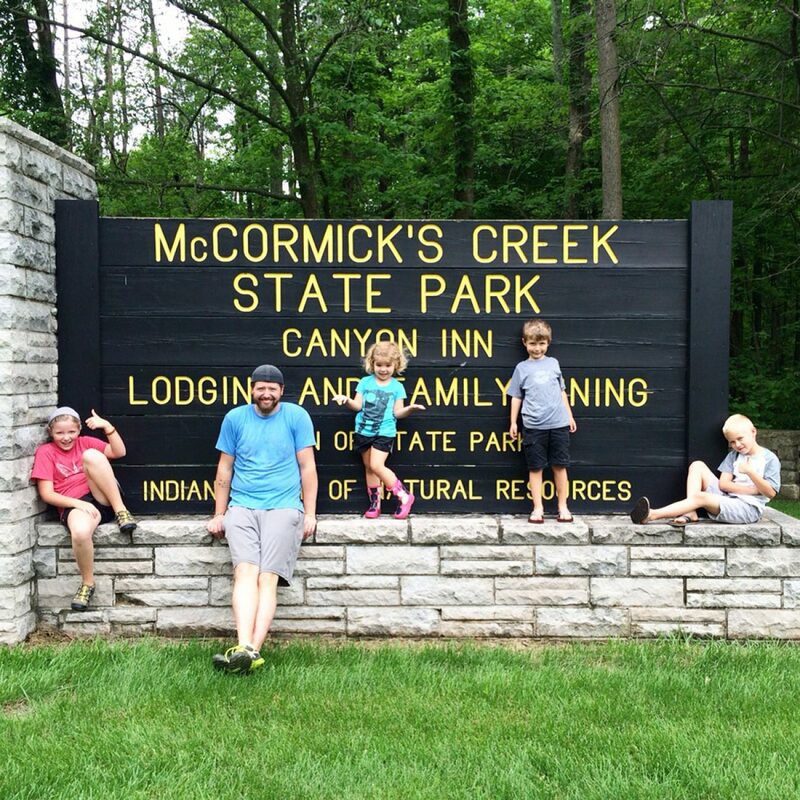 At McCormick’s Creek State Park there are NO sites with water hook ups. So we pull out and go fill our tank with fresh water, (something new) and we asked the DNR to see if there was another spot we could go in because the one we were in was super unlevel and they weren't very busy. Everyone at the park was so nice and helpful. The DNR guy even helped Jon back up into the new site (something we have NOT mastered yet). So, next thing is to unhook the trailer from the truck...well, I’m looking for separation in the grease plate and the hitch and never see it, so I assume I need to keep raising the trailer... POP...NOTHING...CRAP! I blew the fuse in the jacks and nothing is working now. A quick call to Ditching Suburbia, Michael Boyink, and a call to my dad to stop by Lowes and grab some fuses on his way to come see us and we finally got it working again (another lesson learned). My sister is a organizational master. While she was here she went through my pantry and all our closets and helped me purge even more. SO MUCH MORE, actually. The pantry was a tough one for me. I’m so used to having all my ingredients so that I can bake just about anything I want at any given moment...those days are gone. So far, I tried baking these famous Chewy Ginger Molasses Cookies and they were a huge flop. So far I’m hating my oven. I’m going to give it a few more chances. One more thing that got done in Indiana is Jonathan's office area. I needed to make him a standing desk but I just really didn’t want to. Que helpful dad. I didn’t have any of my tools anymore and it just seemed like a project that my dad would be great at. He came that first night and measured for Jon’s desk and built it all in one night. It looks great. We still would like to stain the wood and do a few more things to his area, but the desk at least lets him be able to work comfortably. So, thanks Dad! We love the desk. Also, I need to say thank you to my mom. My friend Sonda cut my curtains for me and mom and I tried to attach the backing to them. We didn’t do them exactly like Sonda’s perfect curtains but they’re ok for now. I’ll probably fix them once the trailer is all painted and done. So, thanks mom. It’s nice to know that no one is going to be seeing every move we make in the house now. and we hiked Wolf Cave. All in all, it was a great first trip out of Tennessee. It was a fast and furious trip, but it was so good to get to see my family again before our big adventure begins.The wedding was beautiful, even in the rain, and the girls did a great job and looked so pretty in their special dresses. Now...back to Tennessee to close on our house!